Track Twenty-Nine does not typically cover Baltimore, but our friends further up the bay are having some major transit issues that I think warrant a post. 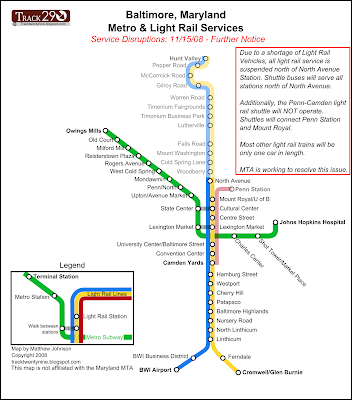 This weekend, MTA Maryland, the agency which runs Baltimore's transit system announced that due to emergency maintenance on their light rail vehicles, major service cuts would be going into effect immediately. These cuts are temporary, but MTA has not yet announced a timetable for renewal of services. As of November 15, all light rail services north of North Avenue are canceled. A shuttle bus will take passengers to all stops north of North Avenue. Additionally, no service will be provided on the Penn-Camden Shuttle. Buses will take passengers between Penn Station and Mount Royal/U of B Station. 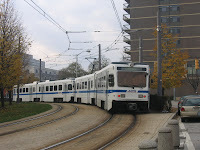 On the rest of the light rail system, one-car trains will be in operation, with the potential for serious overcrowding. Apparently the cause of these disruptions is damage to the wheels of MTA's LRVs caused by "Slippery Rail Season." This season is recognized by many transit agencies, including WMATA, as the time of the year when falling leaves get ground to mush on the tracks. This causes rails to be slippery and reduces traction and braking power to trains. According to MTA, their LRVs are more prone than other systems to be damaged by slippery rail season. MTA reports that staff are working overtime to resolve the problem. While this is reassuring, I wonder what is being done to keep this problem from being manifested again next year. If you're up in Baltimore, hang in there, hopefully service will be restored shortly. *The Metro Subway is unaffected by these problems.